Last weekend, I traveled to Louisville, KY to participate in the second annual Imaginarium convention. It was a time of laughs, of lessons, and White Castle. I did some panels, sold some books, and hung out with some very good friends. I give my thanks to Stephen Zimmer, Frank Hall, Susan Roddey, and all of the staff that help make Imaginarium a great local con to attend. Of course, the main event for Armand Rosamilia, Jack Wallen, Jay Wilburn, and myself was the official paperback release of Honolulu Hellmouth. With it, the Hellmouth trilogy draws to a close and Solomon rides off into the sunset. Right now, these guys are the reason I go to some cons. While I work on building the base and getting my name out, cons are expensive. As a small press/self pubbed author without a large following (as of now), is attending cons worth the monetary investment? I believe it is. Sure I won’t sell enough books to justify the gas, hotel, food, and other costs. What I gain is from the networking that happens at cons and the friends you make with other writers. Armand, Jack , and Jay have become like brothers to me and it’s worth paying the money for the time we get to hang out since we are separated by a nice chunk of the US. I’ve also been able to meet other great people like Peter Welmerink (who will be a guest here next week), Jessica McHugh, Aaron Drown, Rob E. Boley, and the Charon Coin Press crew; Jerry Benns, Christine Benns, and Margie Colton. The networking is important also. You get to talk to new presses, new people, and listen to panels (by either attending one or being on one). I’ve learned to never miss an opportunity to talk shop. These conversations can steer you to good people and keep you out of the hands of bad ones. One old saying I’ve never excelled at was that one should listen and keep one’s mouth shut, but at cons, I follow it to a tee. You get out of cons what you put in. I need to sit down and figure my con list for 2016. If you know of any in the Mid-West shout them out in the comments. Don’t be shy, let us know where and when they are so people can check them out. 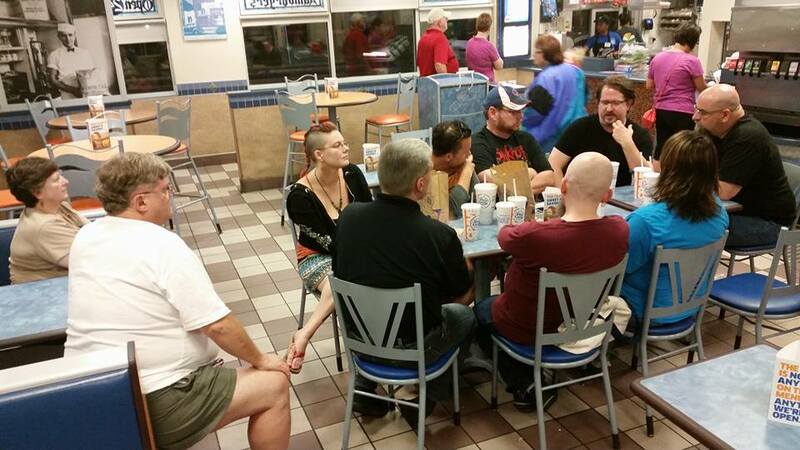 The great ArmCast Podcast session at White Castle during Imaginarium 2015. At Imaginarium, the Hellmouth Circle Will be Complete.